Speed Limit Victory in Seattle! Last Monday, the Seattle City Council unanimously passed a resolution to lower speed limits on all non-arterials citywide to 20 miles per hour, and to lower speed limits to 25 mph on unsigned arterials in the center city, which will dramatically impact streets in our area in a positive way. This victory is huge, as the 20/25 mph campaign was one of Seattle Neighborhood Greenways’ citywide goals for 2016, and was accomplished with three months to spare. This legislative achievement is also a big step forward for the citywide Vision Zero campaign. 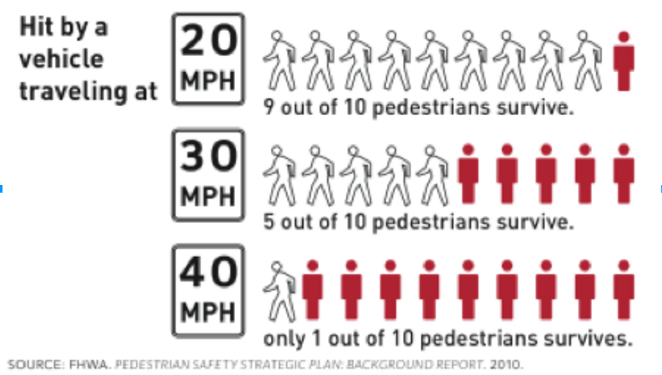 Lower speed limits pave the way for the Seattle Department of Transportation to be able to more quickly implement traffic calming, due to the fact that the department looks at the relationship between the speed limit and what drivers are actually driving when making determinations. SDOT has also noted that they had begun setting traffic signals to the new 25-mile-per-hour standard as early as the beginning of 2015, with the result being that traffic appears to be moving more efficiently. Central Seattle Greenways will lead a Memorial Walk and Solutions Meeting to honor the life of Desiree McCloud and to bring attention to the many collisions that have happened to people who bike along streets with streetcar tracks including East Yesler Way, where Desiree McCloud crashed on her bicycle. The Seattle Department of Transportation is still investigating the cause of the crash. Our solutions meeting afterward will focus on the broader issue of safety in streetcar corridors. The Memorial Walk will start in front of Bailey Gatzert Elementary School at 1301 E Yesler Way. We will walk across the street to the ghost bike marking where Desiree crashed her bicycle. Desiree’s mother, Penny McCloud will speak, as well as other community representatives. Seattle Neighborhood Greenways honors people who have died walking and biking on Seattle streets. We only do Memorial Walks with the full blessing and cooperation of families of the victims. This advocacy honors families, provides a forum for the community to grieve the loss together, and gives communities an opportunity to address street safety. We meet the second Monday of each month, 6:00 – 8:00 p.m., at Central Cinema (1411 21st Ave, Seattle). Everyone is welcome.